The Mad Box console has been described as "the most powerful console ever built", making it a direct PS5 and next Xbox rival. Mere weeks after the PS5 and Xbox Two were publicly called out by Slightly Mad Studios' chief executive, we've now got our first-ever glimpse at the Mad Box itself – a system that CEO Ian Bell described as "the most powerful console ever built." The first-look reveal of the Mad Box console came via CEO Bell's official Twitter account. The tweet reveals the design of the gaming system, which was created by asking video game players to submit concepts of what they'd want a next-generation console to look like. Although, CEO Ian Bell concedes that there could be some tweaks and changes made to the Mad Box before it rolls-out onto shelves worldwide, this is the clearest view yet of what the studio has been busy working on. The PS5 and next Xbox rival has also been shown-off in a short video shared in another tweet shared with the comment: "Indulge. x". Can the Mad Box take down the Sony PS5 and Microsoft's next Xbox consoles? For those who missed the Mad Box call-out, here's what we know so far: it's a brand new next-generation console that was originally revealed by Slightly Mad Studios back on January 2nd, 2019, with respected news site Variety reporting Bell's comments on how "it will be a console as is the Xbox or PlayStation" and that it will launch in "around three years time". And, in statements that excited gamers the world over, the Mad Box went on to be described by Bell upon its reveal as "literally 'Mad'" and fully capable of 4K gaming and VR gaming at 60 frames per second, feats that would easily make it a serious competitor against Microsoft's incoming next-gen Xbox Two console, which is codenamed Scarlett, as well as the Sony PS5. The design chosen for the Mad Box boasts next-gen console features that could help it beat the PS5 and next Xbox. The idea that the Mad Box is a next-generation console is seemingly backed up by these first-look design images, which show a sleek, angular console equipped with touch functionality, customisable RGB lighting, mobile app connectivity, additional Mad Box wireless linking, and the ability to be orientated in three different ways, horizontally, vertically, and wall mounted. The Mad Box design shows the ability for the PS5 and next Xbox rival to be wall mounted. Indeed, if the Mad Box does end up looking like this and boasting these next-gen console features, as well as delivering on Slightly Mad Studios' promise of 4K gaming with 60fps VR support, then without doubt Sony and Microsoft will be worried, as it seems to be a system that could challenge the PS5 and Xbox Two on every level. Naturally, though, despite Slightly Mad Studios already reportedly having "multiple investors already offering the required funding for us to see the product to completion", with three years before launch there is clearly still a lot of work to do to see the system reach completion and hit the market. And, with calls by gaming industry analysts suggesting that both the PS5 and Xbox Two could be with us by E3 2020, the question remains as to if a 2022 release date for the Mad Box would be too late, with its rivals building up an unassailable lead in the market. 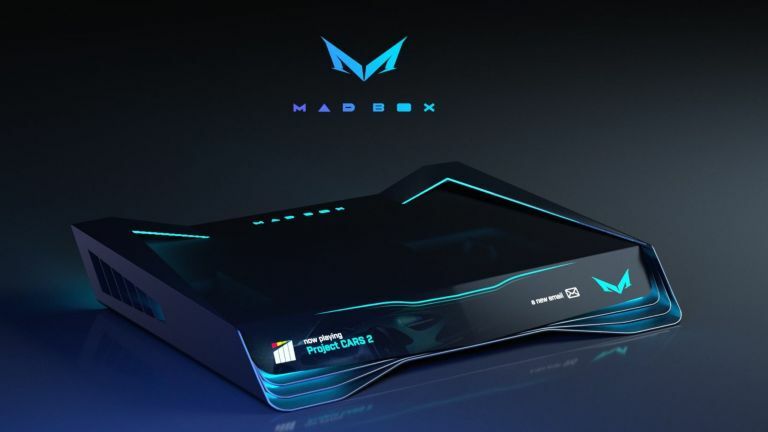 One thing is for sure, though, with the Mad Box looking set to enter the gaming console market the established players will have to up their games to stay competitive, which is only good news for gamers, who will get better hardware and software to play as a result.